We are still in bonus time here at blog headquarters. I was able to get my monthly quota in pretty quick this month thanks to a strong push out of the gate. That means we get some extra time to focus on subjects that have already been featured in a previous post. I’ve typed it once, I’ve typed it a hundred times, the greatest thing about being a birder photographer is every outing is like a new beginning. Even if you have a bird in your gallery, you can always try to improve your image. Better technical, more interesting posture or even unique behavior. Note, “birder photographer” was not a typo. It is amazing how many times the question comes up as to whether you are a birder or a photographer as if they are exclusive titles. With my brother Ron on this, we are answering this question with a resounding “Yes” from now on hehehe. 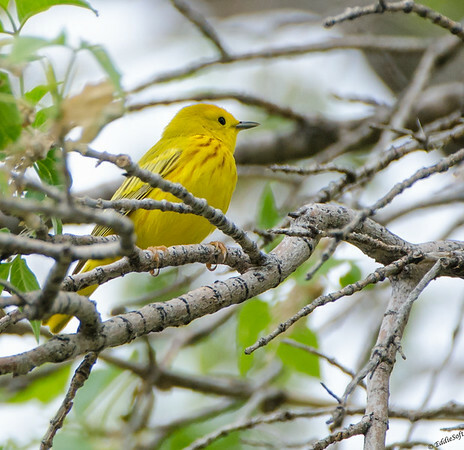 … the Yellow Warbler. You may recall that this brightly feathered bird made its debut back on April 15th, 2015 (link here). 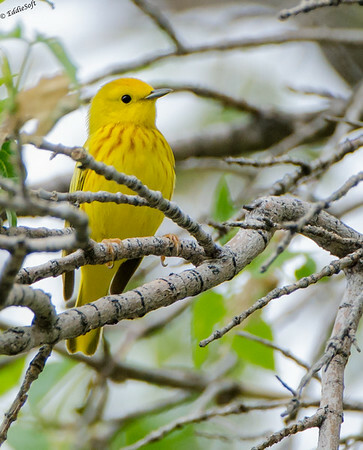 Mr. Yellow from the previous post was found at Lake Andes in South Dakota. This new specimen was spotted on our trip to Colorado back in May of 2014. True to the statement above, I happen to like these first two shots better than the previous set (especially the first one). Hit the jump to see a few more shots of the yella fella.